Walnut shells and white birch make Olivina Men Exfoliating All-in-One Scrub a must-have for shaving. This bourbon- and cedar-scented exfoliator leaves skin silky smooth. 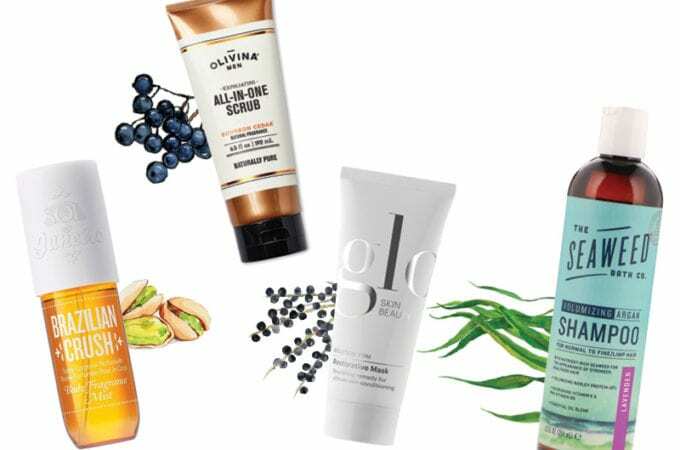 Walnut, birch, basil, elderberry and olive are just some of the other food-based ingredients that nourish your skin while maintaining its vegan and gluten-free status. Leave it to the Brazilians to create a body mist as delicious as it is potent. Brazilian Crush, Sol de Janeiro’s body mist, instantly transports you to the sultry beaches of Rio de Janeiro. With notes of pistachio and salted caramel, Brazilian Crush is perfect for daily use on body, hair and lingerie. Combat dry skin with Glo Skin Beauty’s Restorative Mask. The ultimate remedy for dehydrated skin, this antioxidant-rich mask helps restore its strength and elasticity, creating softness while improving its overall appearance. Ingredients like wild yam and acai are anti-aging and even help fight acne. You don’t have to look past the label to know The Seaweed Bath Company’s Argan Shampoo is made to tackle even the driest hair. Formulated with plant-based elements like potato starch and leaf juice, it includes more than 65 vitamins and minerals to leave your hair as hydrated as it is healthy.